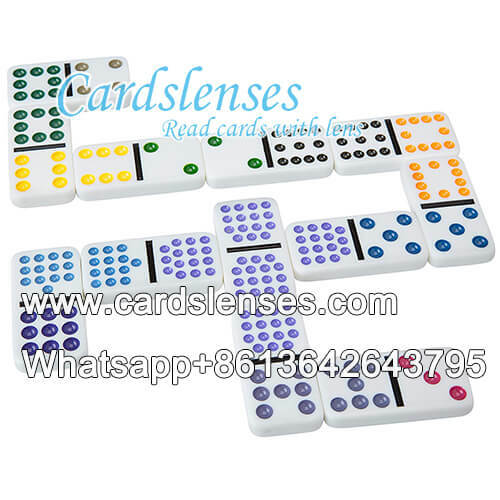 There are many varieties of domino games, if you want to play some complex games freely, a professional marked back double twelve color dots dominoes is in need. The luminous marked double 12 color-code dots dominoes are processed with professional invisible ink solution by GS sophisticated staff. It is marked very perfect that people can’t find any problems on them, only with invisible ink contact lenses or sunglasses that can see UV ink or IR ink. Due to these magic domino games device, player can know the information of double twelve color dots from the back markings and predict the game results conveniently. -Can be used in many complicated domino games. -Includes a set of 91 dominoes. -White board and color-coded spots.